Over the past several years EZCS has received many consulting requests from our clients. As we approach 200 software clients, we are pleased to announce the formation of EZ Custom Consulting Group! Q1. How much does the software cost? A1. For a limited time we are offering a ONE PRICE FITS ALL pricing policy. One time software license fee is $999 irrespective of your company's size or number of optionees! Q2. What do I get when I license Easy Options/ESPP Custom (tm) software solution? A2. You get a complete "tool chest" for stock option administration and 10-K compliance reporting. Four modules are included, Options & ESPP record-keeping modules, Insider Reporting module (SEC Forms 3,4 & 5) and a Valuation module (for FAS 123R expense reporting and compliance). All in all you get 170 customizable reports, record-keeping and valuation tools, so it will be hard to find what is not there. Q3. Which software on the market has comparable features to yours? A3. We (and our clients!) are proud to point out that our software solution compares "feature-by-feature" to E-Trade's Equity Edge and Transcentives' (Computershare) Express Options line of products. EZ was also nominated for the "Vendor of the Year" award by Compliance Reporter magazine, an independent publication! Q4. Can your service and support compare to your competitors if you are less expensive? A4. When it comes to customer service we do not cut corners! We recognize that our clients are our best source for referrals so we keep them very satisfied. Our software is less expensive because we keep our marketing costs to a minimum and try to keep our pricing reasonable. As a result we enjoy a very high client retention rate and have great testimonials about our service from our clients. Q5. How to request a demo version of Easy Options/ESPP Custom (tm)? Q6. Are there any additional fees associated with the software purchase? A6. Absolutely none. At the time of purchase or any time later you may elect to purchase additional services form us. Our services include data conversion and system's set-up and load, systems support and maintenance and stock administration outsourcing services. Q7. What does One-time Data Conversion & Set-up Service initial? A7. We would set Stock Price Table, Vesting Schedules, Option Plans before we proceed with data imports. We will import Employees Table, Grants, Exercises and Disposition table and process your terminations. If you provide us with the information we’ll be glad to import historical Fair Values or recalculate them based on your prior footnotes disclosures. Q8. How quickly can I have my data loaded and initial ASC 718 (FAS123R) (10-K) reports run? A8. Normally we can turn it around in a few days. To be on a safe side we give you ONE WEEK DELIVERY GURANTEE. If for some reason we do not get back to you in one week's time your conversion project is on us; it is FREE of charge! Q9. Can I load the data by myself? A9. Of course. However, if you are on a tight schedule or have limited resources we are here to help you. If you are not in a rush you may choose to do it for training purposes. It will likely take you longer since it is hopefully an infrequent exercise! Q10. How much will I pay for Software Support & Maintenance Fees? A10. If you purchase the software during ONE PRICE FITS ALL promotion period your annual maintenance is $999 payable quarterly or annually, the choice is yours. First 90 days of support and maintenance services are included in the purchase price. Q11. What services are included in Software Support & Maintenance Fees? A11. We provide you with unlimited customer support via our “800” number, e-mail and online chat-room. Product training for existing customers is included in customer support. On the maintenance side we guarantee a minimum of 4 software release upgrades a year thus ensuring continues compliance. Q12. How long have Ez Custom Software Solutions, LLP been in business? A12. This year (2007) in September we will be celebrating our 10th anniversary. Q13. How many corporate clients use Easy Options/ESPP Custom (tm) software solution? A13. We have 168 paying corporate clients and many more en- clients as some of our clients are stock plan administration outsourcers themselves. Q14. Is the software ASC 718 (FAS123R) compliant? A14. We go through great lengths to keep our software in compliance with applicable laws and regulations, ASC 718 (FAS123R) is one of them. The software is ASC 718 (FAS123R) compliant. Q15. Can the software handle Restricted Stock Grants? A15. Yes it can do it easily! 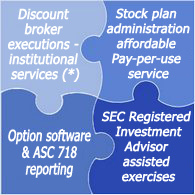 Restricted Stock Grants are identified throughout the system at many different levels. Q16. What if I don’t like it? Is the software purchase refundable? A16. Your purchase is fully fundable for 30 days! No questions asked! Q17. What if I need additional training? A17. One-on-one training is included in your support and maintenance fees at no additional cost to you. Q18. Can the software solution be customized to meet my company’s specific needs (performance stock, shareholder loans, dividends, etc.)? A18. We routinely customize our software to meet our customer’s specific needs, ranging from new reports and data interfaces to more complex product enhancements. Q19. Our company’s stock is listed on two exchanges in two different currencies. Is Easy Options/ESPP Custom (tm) software solution multi-currency capable? A19. We have clients in many different countries. Our software solution allows option grants to be granted in several currencies as well as ESPP purchases to process in a number of currencies. Q20. How do I know that Easy Options/ESPP Custom (tm) software solution is compliant with applicable laws and regulations, ASC 718 (FAS123R) included? A20. We have been profiled by Compliance Reporter magazine in September 18, 2006 issue and this year we have been nominated for their "Vendor of the year" award. Please see here. Q21. How do I purchase the software? NOR IT CONSTITUTES AN OFFER TO SOLICIT OR PROVIDE BROKER-DEALER SERVICES TO UNITED STATES PERSONS. Copyright © 2000-2019 Ez Custom Software Solutions, Inc.